ATP is a full TradePost replacement mod (and won't work with any other addon replacing the same TradePost.swf file). The aim is to enhance every aspect of the trade post in the long run. The first new features were focused around lairs since that's what my cabal needed, but the rest will be coming up soon. 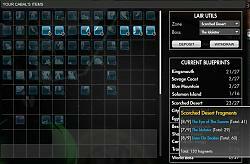 - Lair mode (both): See a summary of how many (unique & total) fragments you have for each zone/boss, move easy all the fragments for a boss or zone to/from your inventory. 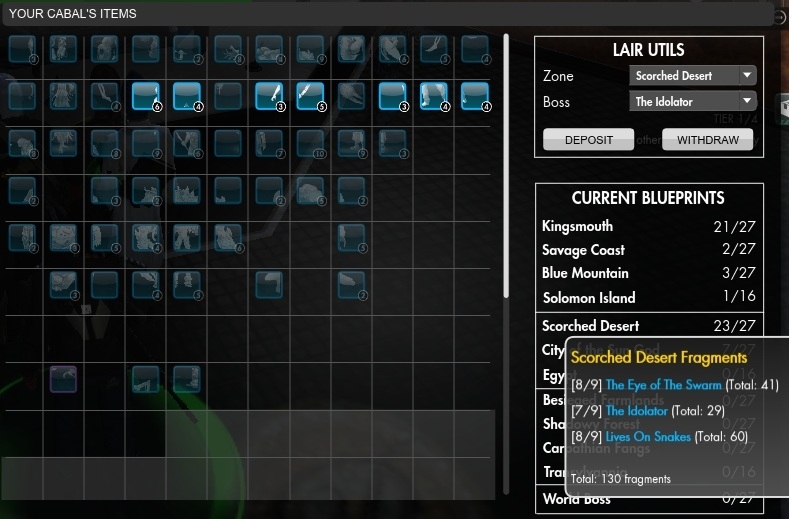 Withdrawing fragments requires a 4x4 bag (with "lair" in the name) for region bosses and a 9x3-6-9-... bag (with "lair" in the name again) for zone bosses. - Inventory mode (only personnal bank now): Adds a search form to find items quickly in the bank and has 2 options to do some auto-stacking. "Stack Items from inventory to bank" will scan your bank first and then the inventory for any items that can be added to existing stacks. Check the options to configure how the mod should work once a stack is full. * My Orders button appeared at the bottom of the market tab. It just lists your current items for sale. More features incoming in there soon! Is it just me or does the search in inventory mode often not work? Sometimes it works, but often it does not. You mean that if you buy the 300 slots with PAX and buy some from item store, the slots above the 300th never display? There is something odd with the scaling of the icons (for items in the bank). I set the scale for the bank to 125%. If I move an item from inventory -> bank, it's all good. If I move an item from bank -> inventory or bank slot -> bank slot, when I pick up the item from a bank slot, it is huge and makes it difficult to place it. I have my inventory scale set to 75%. I included an image of it so you can see what I mean. An unintented side effect of the bank scaling I guess. I'll have to check if I still have control over the item's movieclip while it's being dragged to scale it back down to the normal size. Last edited by EthTSW : 12-29-2012 at 07:47 AM. 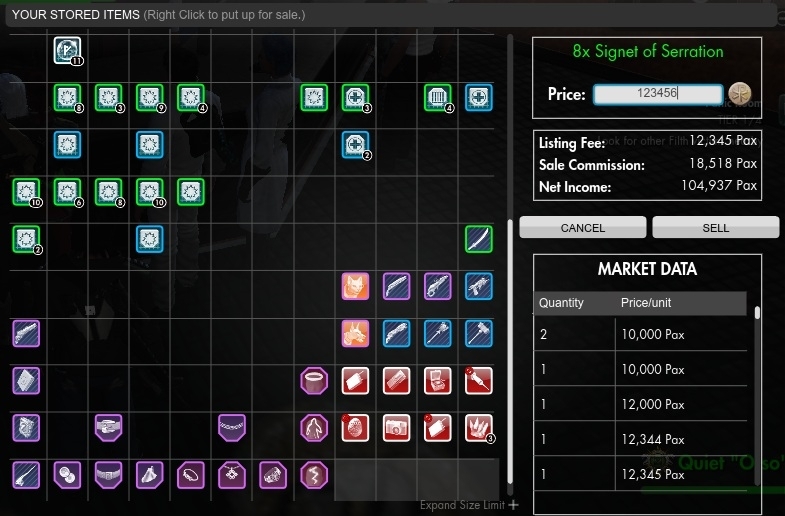 I would be nice to have an option to disable the automatic undercutting/lookup thing OR to have to it restore your previous search when you switch back to the market tab after posting something for sale. One small thing I noticed is that tab/shift+tab don't seem to work between the QL boxes and text box. Not that big a deal since the rest of the functionality eclipses this small thing. It would seem that the default market interface is nothing short of broken. You just can't find some stuff that you can find using this addon unless you know exactly what to search by name. Last edited by kellewic : 12-09-2012 at 02:57 PM. Thanks for this awesome mod! It has made my life soooo much easier. Suggestions (for when you get back to this of course). 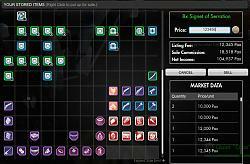 1) Reset button on the Market Tab, especially for Keywords and Exact name. 2) Implementation of inventory folders if possible. I'd like to keep my signets in one drawer, my weapons in another, crafting items in a third. etc. Not sure its possible though. 3) Figure out how to work around the sales bug. Essentially TSW never tells you when the item's sale expired. Can you log things that are marked for selling, and then provide that date in a tool tip along with the cost? Awesome thanks for your reply. So i presume that we will get refunded the listing fee if i cancel listing. Last edited by gliss : 11-03-2012 at 11:21 PM. Although items in my bank say they are for sale have the coin underneath them when I click my orders only two items appear (these i put up a couple days ago) Is My Orders not working properly or are items not showing that they did not sell? I believe this one is on Funcom, items don't get moved back to bank when the auction expires. And I certainly miss a reset button as well, will be added when I get back to that mod "soon". Thanks for the reply turns out now I cant get rid of the icon but I believe that is a TSW bug. Might indeed be a bug with the game. I'll still check it out a bit more to see if there is anything I can do to make the icon disappear for good when all mails are read. Edit: I found something at least, my addon isn't properly marking mails as read since a recent update. Hopefully fixing that might make the mail icon go away again. Also do you have somewhere we can donate? Last edited by EthTSW : 09-09-2012 at 08:51 AM. Addon development takes a lot of time. If you really like this addon and want to support it, please consider making a donation via PayPal, any amount is appreciated.